Image caption The judge said the actions of the defendants had led to serious economic consequences. Nine top officials have been given tough jail sentences for their role in the near-bankruptcy of one of Vietnam's largest state-owned companies. Ex-chairman Pham Thanh Binh was given the maximum sentence of 20 years in prison for violating state rules. The Vietnam Shipbuilding Industry Group (Vinashin) ran up debts of up to $4.5bn (£2.9bn) after rapid expansion. The defendants were convicted of being directly responsible for a loss of $43m. 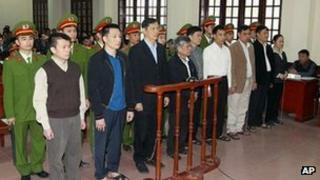 The court, in the northern port city of Hai Phong, sentenced the remaining eight defendants to between three and 19 years in prison. Vinashin was established in 1996 with the goal of becoming one of the world's top shipbuilders. At the heart of the case was the loss of $43m incurred through the purchase of ships without government approval and two failed power plant projects. In his ruling, the presiding judge, Tran Van Nghiem, said the actions of the executives had led to serious economic consequences and damaged the country's prestige in the eyes of foreign investors. After the scandal, agencies downgraded Vietnam's credit rating and cited Vinashin as one of the reasons. In 2010, Vinashin defaulted on its first payment on a $600m loan to creditors. Binh is considered to be close to Prime Minister Nguyen Tan Dung, who appointed him to office.